Yup, here is another black and white/striped outfit. A classic color combination that I will never get sick of. 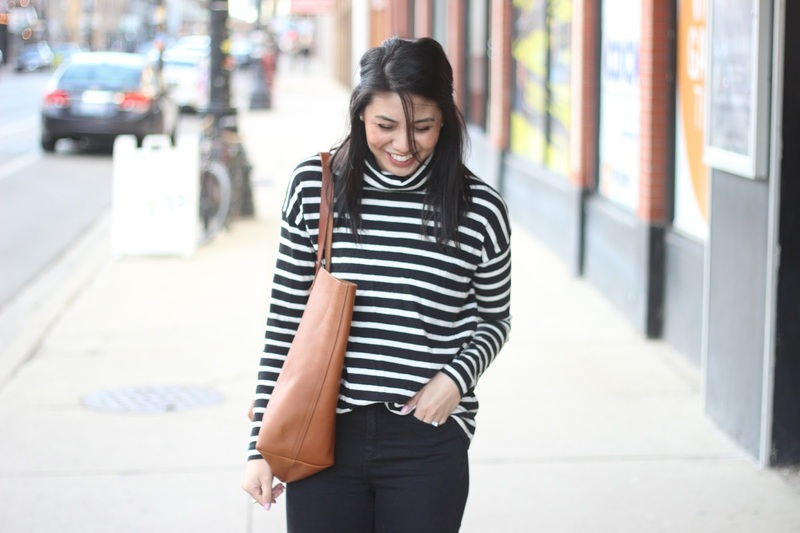 I love the oversized fit of the striped turtleneck without looking too slouchy. No joke , I’m leaning towards getting another one. 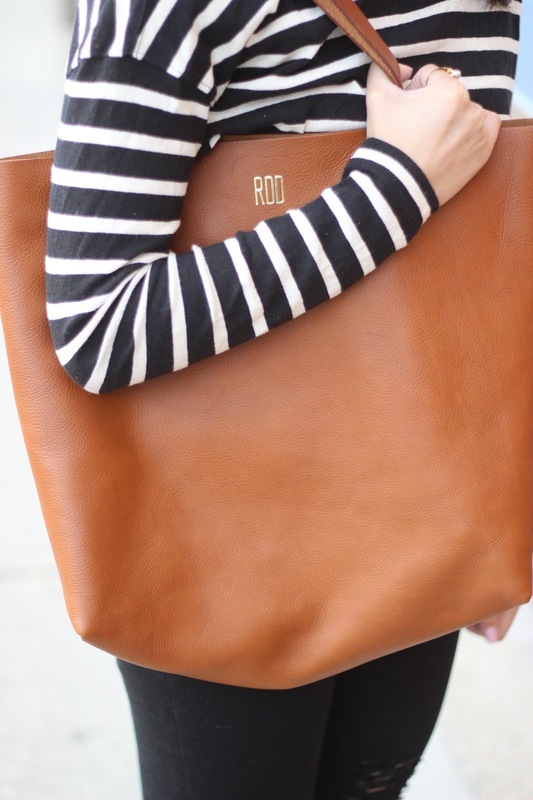 My tote from Madewell is my absolute fave! I love the personalization on it! Not only does it feel more custom, but I can tell which tote is mine when I see others wearing the same one! It is simple but well made. I know this bag was made to last. I hope you all have a great weekend! Don’t forget you can still enter to win a free customized Macbook and/or iPhone skin case. Just enter here! Stripes are just too perfect! Thanks so Diana, thanks for stopping by! Nothing wrong with black and white – it's my fave and it suits you so well! So Parisian chic! Always a good combo! You look super chic. I love your tote, it is SO gorgeous!!!!! 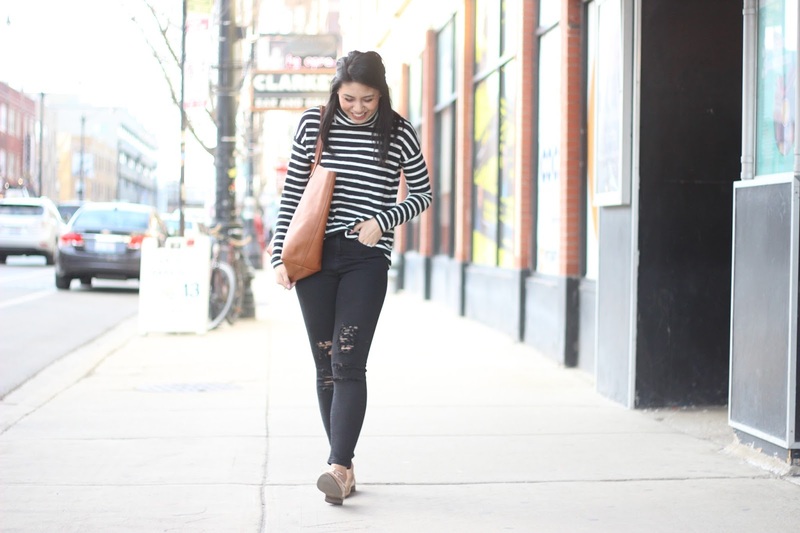 I love how perfectly these jeans fit you! Happy Friday. 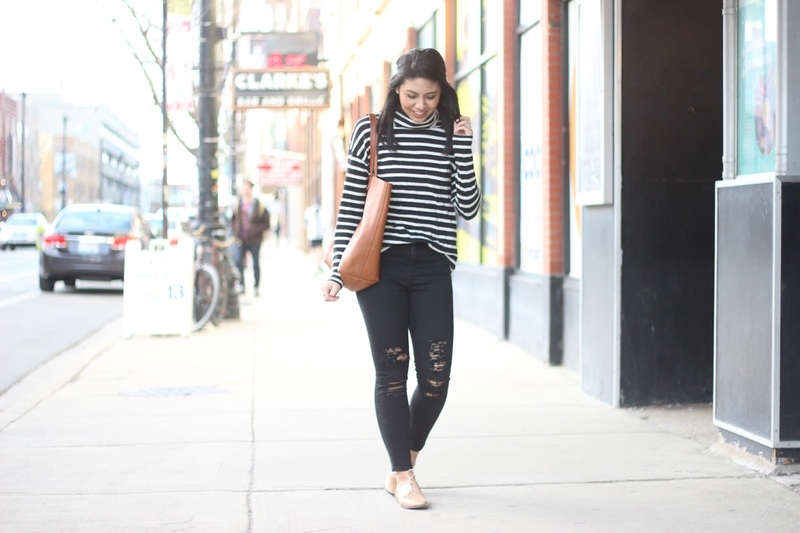 Love that striped top! This is a great simple chic look–camel always pairs well with black! Very nice look, love the bag especially! You look amazing in the black and white combination. I love the brown bag and shoes, they create a contrast to the outfit. You look dashing! That is so sweet of you! Thank you so much Kelly! Loving the black and white stripes — so pretty! This is such a beautiful outfit! 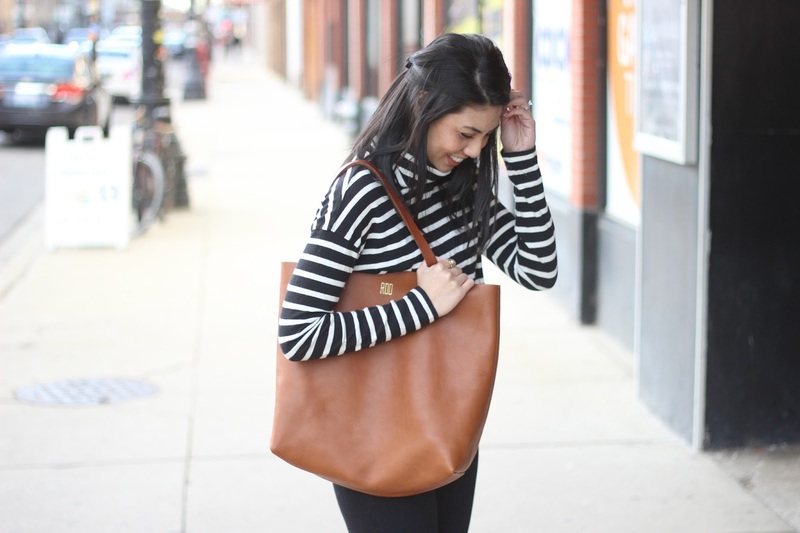 I love the black and white paired with the brown tote…gorgeous! Love your black and white outfit! Very casual for any occasion! Love this look ! Simple and chic ! Love your outfit and that tote!! Nothing like stripes! Love ur denim! This turtleneck is perfect! You can never go wrong with black and white! 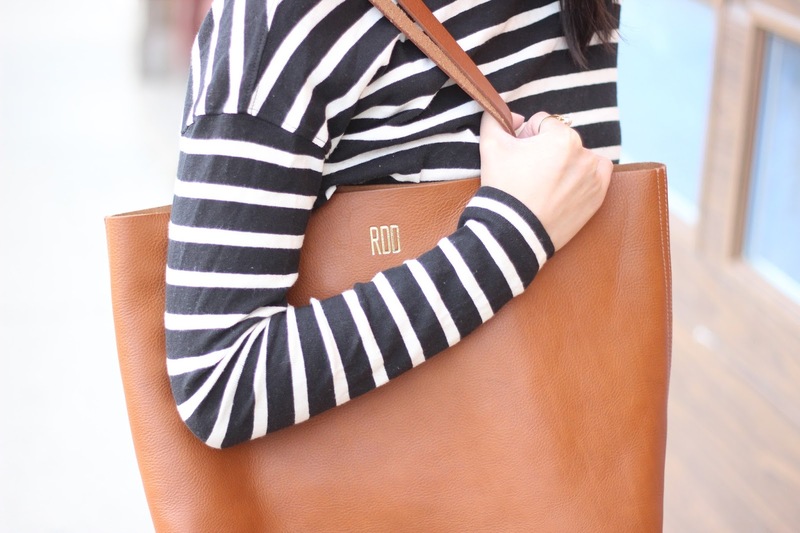 I love the monogrammed tote! looking so cute in turtle neck!! Wow, that's such a cool outfit. So simple but chic! I'm in love with your bag! Beautiful, classic look! I love the bag! This is so classic! I love striped anything, and this turtleneck looks amazing on you. Love the bag too- the monogram is simple and chic! You can't ever go wrong with stripes. I love the tote, too! 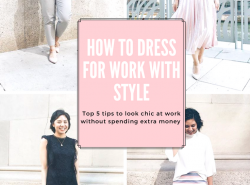 This is so perfectly chic and easy 🙂 Love it!! This is such a cute casual look! 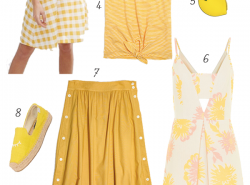 You could style that top about 100 different ways! Nice outfit! So simple and chic! Perfect outfit for casual look, love it. Yes to black and white and bonus points if it's stripes! Can never go wrong with this combo. I absolutely love Madewell! This transport tote is awesome! Black & white again? More like black & white forever! Love it. Black & white is a classic. Regardless if it's styled casually like you've done here or dressy….it's perfection in my book. You can't go wrong. You look adorable.